Have you ever wondered why most of the Vinaigrette in the grocery store are made with 10, 20, sometimes even almost 30 ingredients? I remember growing up in Provence watching my mother whipping vinaigrette before every single dinner. She would mix in a giant bowl, delicious extra virgin olive oil, a robust aged vinegar (the flavor would depend on the main dish), sea salt and pepper and voila! I decided to do the same thing for my family and friends more than 20 years ago here in this beautiful country. And Provence Kitchen was born. For all these years I stood by the same commitment; making the same vinaigrette and dressings that my mother made for us growing up. So that is what you buy when you put on your hands on one of our products; Simple Goodness. Free of all the stuff that the other guys use in their products. A freshly locally made, in a small batch, vinaigrette with natural ingredients. 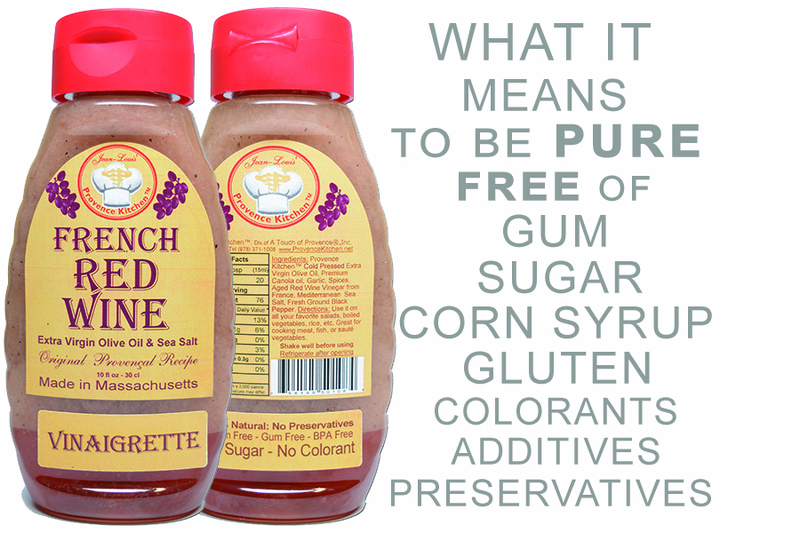 It is free of Gum, Sugar, Corn Syrup, Gluten, Colorants, Additives, and Preservatives. Who needs that stuff?